This model is an accurate casting of a skull reconstructed from an original that was discovered in a iron ore working at Broken Hill, in north west Rhodesia (modern-day Kabwe in Zambia). 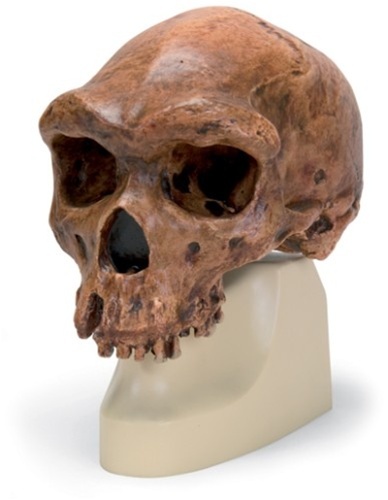 It is an example of the early man, Homo sapiens rhodesiensis or a Homo erectus rhodesiensis, and indications exist to point to both these classifications. For this reason, there is also a wide spread in the estimates of the specimen's age based on differing scientific assumptions. An early example of an ancient Homo sapiens (as classified by Henke and Rothe 1994) or a Homo erectus rhodesiensis. Age: probably 150,000 to 300,000 years old. Previous estimates were of 40,000 to 60,000 years.